Mix plain flour, turmeric powder, oil with water to make a soft dough.Do not overwork it. Soak the splitted channa dal, boil & starin. Add grated Coconut with bolied channa dal to grind. Heat a pan, add the ground chenna dal paste with jaggaery to make a fine paste. Allow to cool. Make small balls of the soft dough & flatten it. Place the chenna dal mix in the centre & fold to get it stuffed & flatten it again. Heat ghee(clarified butter) in a tawa & start to cook both sides equally like you cook for a chappathi. My cousin Anusriram of Chandrabhaga has passed me "The Rocking Girl Blogger Award". Thanks a ton dear..
Wow Pooran poli looks delicious & mouth watering.. enakku onu kidakuma? First of all Poli looks really delicious. I love this poli. Congratulations on your award and thanks a ton for passing it to me. Congrats on the award and the Pooran poli looks delicious. Love puran poli, looks mouth-drooling, yummmm!!! Hi sri, congrats on the award. delicious looking poli. I love them too. I have something for you in my blog, I think you did not see it. Check out the end of the post. poli looks so yum,..nice step by step pics,..nd congrats for the awards,..
Oh that is so good.. I love puran poli and it's been years since I made this. Must give it a try soon. Hi, your pooran poli looks awesome! Congrats on the award. 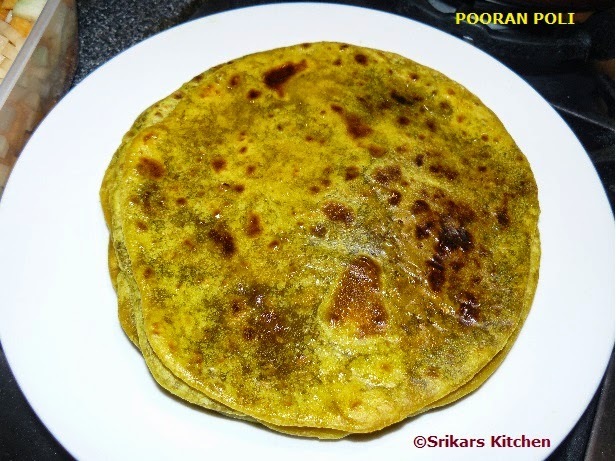 I have always wanted to try and make puran poli at home. Will try this now, thanks to your recipe.I have all the ingredients at home. I have tagged you at my blog, please visit. Poli looks delicious and congrats on your awards.